Check out 5th Ward real estate and learn that during Newport's Gilded Age (1885 - 1913) the 5th Ward emerged as a close knit community of working class families. Many of the original residents were Scottish, Irish, and Italian laborers who made up the domestic work force in the mansions along Bellevue Avenue. The influx of immigrants created a secondary housing boom of wooden homes in the 5th Ward and Broadway areas. Read more about 5th Ward amenities or view real estate for sale in this popular Newport community. Today, the 5th Ward's location on the south edge of Newport Harbor makes it a popular place for year round and summer residents. Although there are quite a few large homes overlooking the harbor, most 5th Ward properties are of moderate size and grouped closely together. The neighborhood retains much of its Irish heritage, and a number of 5th Ward families have been there for generations. Learn about 5th Ward homes and discover the Harbor side of Wellington Avenue where King's Park provides 5th Ward residents public access to scenic Newport Harbor. 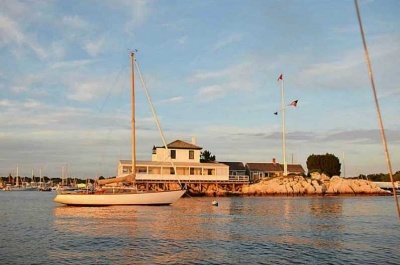 The Ida Lewis Yacht Club sits at the end of a long pier, and Harbor Court, summer home to The New York Yacht Club, occupies a high perch just to the west. The Thames Street area of downtown Newport is a few blocks away and includes an ecclectic mix of popular haunts like the local Hibernian Hall, Gary's Handy Lunch and Scales and Shells seafood restaurant. In addition, just a short distance from 5th Ward lofts, condos, and homes, are several beautiful beaches to the south on Ocean Drive. 5th Ward homes are just a block from King Park, where you will find a bandstand, picnic tables with a covered pavilion and a large grassy area with a playground. There's also a fishing pier. Just off Morton Ave. is Morton Park, which also has a playground and provides some nice green space. There are several restaurants and cafes close to 5th ward, and it's not far to the popular wharfs off Thames Street, along with all the famous boutique shopping there. In addition, the Newport Public Library is close, as is the International Tennis Hall of Fame, which hosts a yearly ATP tournament on its grass courts. 5th Ward homes are also fairly close to beach access on Ocean Avenue. For schools, you'll find William J. Underwood School on Harrison Ave., and William S. Rogers High School is nearby off Wickham Rd. In addition, the Frank E. Thompson Middle School is quite close. For a tour of 5th Ward homes, contact us online or call (401) 845-9500 to speak with a Hogan Associates REALTOR® who is familiar with the neighborhoods of Newport.